The first time I met Chef Andrea Cavaliere was not at his restaurant, Cecconi’s in West Hollywood, but at Melrose Avenue Elementary School. Dressed in a traditional white chef’s jacket, he was helping children age’s 6-11 plant eggplant, lettuce, parsley, lemon thyme and cilantro herbs in a unique Woolly School Garden along the backside of a chain length fence. Chef Andrea plans to buy the herbs from the school to use in his restaurant. The kids and Chef Andrea will also harvest this produce for a weekly salad bar in the school’s cafeteria. I asked Chef Andrea how he got involved with Melrose Avenue School. “I was invited to the White House last June along with other chefs from across America to meet with First Lady Michelle Obama,” he said with a smile. “She kicked-off a new program, Chefs Move to Schools, which is part of the Let’s Move initiative to fight childhood obesity,” shared Chef Andrea in a melodic Italian accent. The First Lady’s goal is by implementing this program, school breakfast and lunch programs will improve, and families will appreciate nutritious and healthy cooking. Who better to work with parents and school staff to teach children about nutrition than a world-class chef? An adorable fourth grade girl walked up to Chef Andrea and handed him her journal. She told him that she wants to be a chef when she grows up, because of him. She then showed him a picture of a vegetable she drew and she asked, “How would you cook this chef?” He responded with “ You could steam or braise it.” With a perplexed look on her face she said, “What does braise mean?” Chef Andrea crouched down to her level and explained the cooking technique that softens the vegetable and preserves the vitamins. 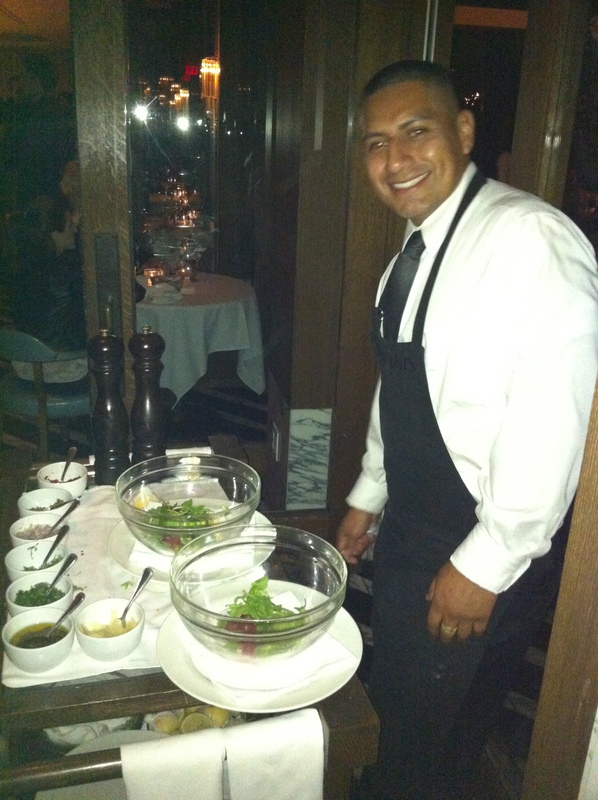 One week later, I went to Cecconi’s for dinner to observe Chef Andrea in his element. Located on the corner of Robertson Blvd. and Melrose Ave., this site has had an illustrious past. It was once Trump’s and then Morton’s. Walking into the classic Italian restaurant we noticed the romantic outdoor patio area and then the centerpiece bar. The bar is a replica of the one at Cecconi’s in London. Enzo Cecconi opened his restaurant in the Mayfair area in 1978. It instantly became the late night, after-theater destination for the rich, talented, and royalty. Madonna discovered Cecconi’s and is a regular guest. Model Kate Moss, and actors Sienna Miller and Jude Law also frequent this A-list dining establishment. Chef Andrea became a celebrated chef with his beef carpaccio, pinched ravioli, baked gnocchi and Cichetti (Italian Tapas). As we sat down, we gazed at the cocktail menu and ordered a pumpkin margarita and a traditional Italian, Casa Negroni. Both were terrific cocktails to begin our dining adventure. Chef Andrea stopped by our table with a warm hug, and said that he would prepare a special meal so we could sample some of the restaurant’s favorite dishes. While soaking in the atmosphere, Janine Giesick, one of the restaurant manager’s, shared with us that she and Chef Andrea both worked in London together before flying across the Atlantic to open the West Hollywood restaurant in 2009. “Many of their patrons from London visit when in Los Angeles. The Duchess of York had dinner the night before and Sharon Osbourne dined here last week,” revealed Janine. We learned that Chef Andrea enjoys cooking many of the items in a wood-oven with olive wood. The wood-oven baked meatballs came out first. Dense and small, these meatballs were full of delightful flavors. Then, the grilled octopus with lemon, capers, thin celery stalks, tiny Italian olives, and heirloom cherry tomatoes with a drizzle of chili oil appeared. The five-inch-long octopus legs were tender and superb tasting. The octopus bathed in white wine before it was grilled to perfection. I will declare this the best octopus dish in Los Angeles. The baked gnocchi “Romana” Gorgonzola is rich and creamy, while the wood-oven scallops and pancetta speared with rosemary branches was divine. I ordered a Summerland “Fiddlestix” Vineyard Pinot Noir 2008 that accompanied the appetizers nicely. When the Kobe beef tartare arrived, I noticed a cracked quail egg on top with yolk trickling onto the beef. The British couple sitting next to us commented on the presentation and decided to order it. When I shared with them my adoration for the octopus dish, they ordered that too. This is a restaurant where the final bill can be high, because of the black truffle dishes. Cecconi’s is the proud owner of the largest Truffle in town. They have a great connection with one of the best truffle distributors. 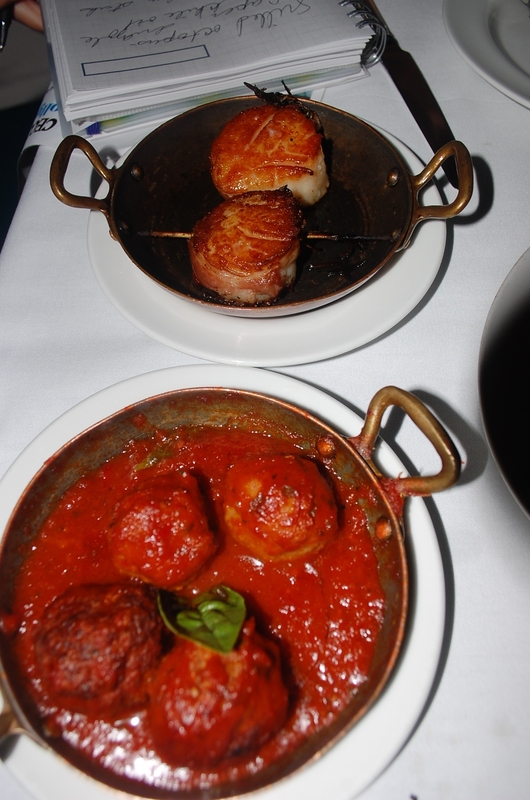 Our waitress, Nicole informed us that the three truffle appetizer specials were each $96. The cauliflower soup with black truffle is $20 and the goat cheese pizza with black truffle is $40. Without truffles, most appetizers are between $12 to $18, pasta dishes range from $14 to $22 and entrees begin around $24. 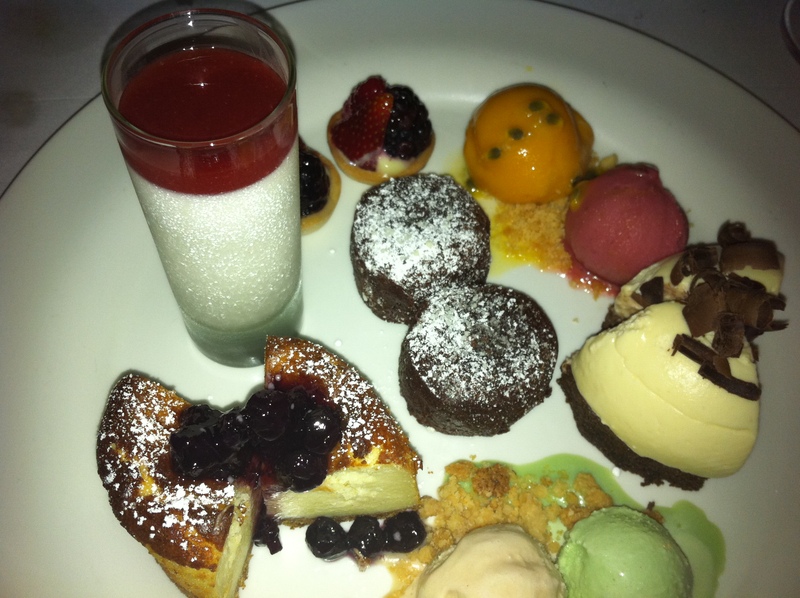 Save room for the desserts, because Monica creates an outstanding Chocolate Fondant with pistachio gelato and a baked ricotta cheesecake with fresh blueberry preserves. Cecconi’s will be open Thanksgiving Day from 8am to 9pm serving specials such as butternut squash tortelli with amaretti crumble, parmigiano, butter and sage and venison medallions with sherry wine and morel sauce. 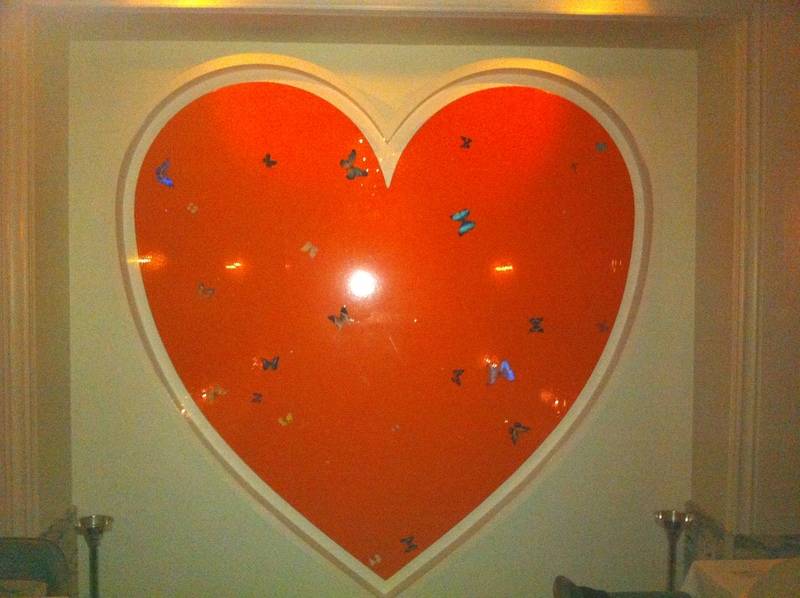 As we were about to leave, I noticed a gorgeous Damien Hirst (popular English artist, entrepreneur and art collector) art piece of a big red heart. Nicole said it’s worth approximately 1.5 million pounds. While looking at the beautiful and colorful artwork, it reminded me of Chef Andrea. He is a chef with a big heart and soul. When he is not in Cecconi’s in Los Angeles, he is either at the Melrose Avenue School picking herbs with the students and creating a healthy lunch for them or flying to Miami Beach to supervise the newly opened Cecconi’s in the Soho House, next to the famous Fontainebleau. He is young, handsome, and full of energy. Of all the chefs in Los Angeles, Michelle Obama invited him to implement her new Chefs Move to Schools program. Chef Andrea definitely has my vote. 8764 Melrose Avenue. (310)432-2000.